Italian wood-carver, known for his furniture in the Venetian Baroque style, characterized by extravagant curves and lavish ornamentation. He influenced in a decisive way the design of the Venetian furniture of the period. At the age of fifteen he became assistant to the Genoese sculptor Filippo Parodi. 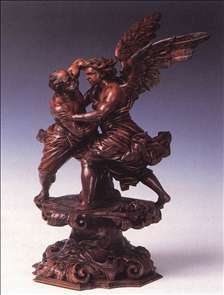 In 1678-80 he went to Rome to study the works of Bernini, but he was also interested in antique art. Returning to Venice in 1680 he produced furniture for the noble families Pisani and Vernier. These were ceremonial pieces, items not intended for practical use but as a display of wealth. However, Brustolon s production was not limited to furniture, he also created statues, crucifixes, tabernacles and other furnishings for the churches at Belluno. His furnishing objects exceed the practical function in order to become true sculptural works. His masterpieces are in the Ca Rezzonico in Venice and the Civic Museum at Belluno. 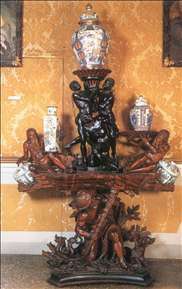 See more details about "Jacob's Fight with the Angel"
See more details about "Vase-stand with Hercules and Moors"